Not to be confused with Altai language. "Altaic" redirects here. For other uses, see Altaic (disambiguation). Altaic (/ælˈteɪ.ɪk/) is a hypothetical language family that was once proposed to include the Turkic, Mongolian, and Tungusic language families; and possibly also the Japonic and Koreanic families, and the Ainu language. :73 Speakers of those languages are currently scattered over most of Asia north of 35 °N and in some southeastern parts of Europe, such as Anatolia and the eastern Caucasus, extending in longitude from Turkey to Japan. The group is named after the Altai mountain range in the center of Asia. The Altaic family was first proposed in the 18th century. It was widely accepted until the 1960s, and is still listed in many encyclopedias and handbooks. However, in recent decades the proposal has been rejected by many comparative linguists, after supposed cognates were found not to be valid, and Turkic and Mongolic languages were found to be converging rather than diverging over the centuries. Opponents of the theory proposed that the similarities are due to mutual linguistic influences between the groups concerned. The original hypothesis unified only the Turkic, Mongolian, and Tungusic groups. Later proposals to include the Korean and Japanese languages into a "Macro-Altaic" family have always been controversial. (The original proposal was sometimes called "Micro-Altaic" by retronymy.) Most proponents of Altaic continue to support the inclusion of Korean. A common ancestral Proto-Altaic language for the "Macro" family has been tentatively reconstructed by Sergei Starostin and others. Micro-Altaic includes about 66 living languages, to which Macro-Altaic would add Korean, Japanese and the Ryukyuan languages, for a total of 74 (depending on what is considered a language and what is considered a dialect). These numbers do not include earlier states of languages, such as Middle Mongol, Old Korean or Old Japanese. The Altai Mountains in East-Central Asia give their name to the proposed language family. A proposed grouping of the Turkic, Mongolic, and Tungusic languages was published in 1730 by Philip Johan von Strahlenberg, a Swedish officer who traveled in the eastern Russian Empire while a prisoner of war after the Great Northern War. :page 125 However, he may not have intended to imply a closer relationship among those languages. In 1844, the Finnish philologist Matthias Castrén proposed a broader grouping, that later came to be called the Ural–Altaic family, which included Turkic, Mongolian, and Manchu-Tungus (=Tungusic) as an "Altaic" branch, and also the Finno-Ugric and Samoyedic languages as the "Uralic" branch. :126-127 The name referred to the Altai Mountains in East-Central Asia, which are approximately the center of the geographic range of the three main families. In the 1920s, G.J. Ramstedt and E.D. Polivanov advocated the inclusion of Korean. Decades later, in his 1952 book, Ramstedt rejected the Ural–Altaic hypothesis but again included Korean in Altaic, an inclusion followed by most leading Altaicists (supporters of the theory) to date. His book contained the first comprehensive attempt to identify regular correspondences among the sound systems within the Altaic language families. In 1960, Nicholas Poppe published what was in effect a heavily revised version of Ramstedt's volume on phonology that has since set the standard in Altaic studies. Poppe considered the issue of the relationship of Korean to Turkic-Mongolic-Tungusic not settled. :148 In his view, there were three possibilities: (1) Korean did not belong with the other three genealogically, but had been influenced by an Altaic substratum; (2) Korean was related to the other three at the same level they were related to each other; (3) Korean had split off from the other three before they underwent a series of characteristic changes. Roy Andrew Miller's 1971 book Japanese and the Other Altaic Languages convinced most Altaicists that Japanese also belonged to Altaic. Since then, the "Macro-Altaic" has been generally assumed to include Turkic, Mongolic, Tungusic, Korean, and Japanese. In, Unger advocated a family consisting of Tungusic, Korean, and Japonic languages, but not Turkic or Mongolic. In 2017 Martine Robbeets proposed that Japanese (and possibly Korean) originated as a hybrid language. She proposed that the ancestral home of the Turkic, Mongolic, and Tungusic languages was somewhere in northwestern Manchuria. A group of those proto-Altaic ("Transeurasian") speakers would have migrated south into the modern Liaoning province, where they would have been mostly assimilated by an agricultural community with an Austronesian-like language. The fusion of the two languages would have resulted in proto-Japanese and proto-Korean. In 1962 John C. Street proposed an alternative classification, with Turkic-Mongolic-Tungusic in one grouping and Korean-Japanese-Ainu in another, joined in what he designated as the "North Asiatic" family. The inclusion if Ainu was adopted also by James Patrie in 1982. The Turkic-Mongolic-Tungusic and Korean-Japanese-Ainu groupings were also posited in 2000-2002 by Joseph Greenberg. However, however, he treated them as independent members of a larger family, which he termed Eurasiatic. The inclusion of Ainu is not widely accepted by Altaicists. In fact, no convincing genealogical relationship between Ainu and any other language family has been demonstrated, and it is generally regarded as a language isolate. It is sometimes grouped with the Paleosiberian languages, but this is only a geographic blanket term for several unrelated language families that were present in Siberia before the advances of Turkic and Tungusic languages there. Starting in the late 1950s, some linguists became increasingly critical of even the mininmal Altaic family hypothesis, disputing the alleged evidence of generic connection between Turkic, Mongolic and Tungusic languages. Among the earlier critics were Gerard Clauson (1956), Gerhard Doerfer (1963), and Alexander Shcherbak. They claimed that the words and features shared by Turkic, Mongolic, and Tungusic languages were for the most part borrowings and that the rest could be attributed to chance resemblances. They noted that there was little vocabulary shared by Turkic and Tungusic languages, though more shared with Mongolic languages. They reasoned that, if all three families had a common ancestor, we should expect losses to happen at random, and not only at the geographical margins of the family; and that the observed pattern is consistent with borrowing. Furthermore, they argued that many of the typological features of the supposed Altaic languages, such as agglutinative morphology and subject–object–verb (SOV) word order, usually occur together in languages. Thus, they proposed that Turkic, Mongolic, and Tungusic languages form a Sprachbund: a set of languages with similarities due to convergence through intensive borrowing and long contact, rather than common origin. In 1988, Doerfer again rejected all the genetic claims over these major groups. [G]enerally, the more carefully the areal factor has been investigated, the smaller the size of the residue open to the genetic explanation has tended to become. According to many scholars it only comprises a small number of monosyllabic lexical roots, including the personal pronouns and a few other deictic and auxiliary items. For these, other possible explanations have also been proposed. Most importantly, the 'Altaic' languages do not seem to share a common basic vocabulary of the type normally present in cases of genetic relationship. Further criticisms, directed specifically against Starostin's 2003 revised lexical lists, were published by Stefan Georg in 2004 and 2005, and Alexander Vovin in 2005. Generally speaking, if two languages or families are genetically related, they tend to diverge over time: the earlier forms are more similar than modern forms. However, an analysis of the earliest written records of Mongolic and Turkic languages shows the opposite. This observation suggests that they do not share a common ancestor, but rather have become more similar through language contact and areal effects. In defense of the Altaic hypothesis, Roy Miller claimed that the criticisms of Clauson and Doerfer apply exclusively to the lexical correspondences, whereas the most pressing evidence for the theory is the similarities in verbal morphology. Miller's rebuttal was echoed in 2010 by Lars Johanson, who called for a muting of the polemic. The list below comprises linguists who have worked specifically on the Altaic problem since the publication of the first volume of Ramstedt's Einführung in 1952. The dates given are those of works concerning Altaic. For supporters of the theory, the version of Altaic they favor is given at the end of the entry, if other than the prevailing one of Turkic–Mongolic–Tungusic–Korean–Japanese. Anna V. Dybo (S. Starostin et al. 2003, A. Dybo and G. Starostin 2008). Karl H. Menges (1975). Common ancestor of Korean, Japanese and traditional Altaic dated back to the 7th or 8th millennium BC (1975: 125). Roy Andrew Miller (1971, 1980, 1986, 1996). Supported the inclusion of Korean and Japanese. Oleg A. Mudrak (S. Starostin et al. 2003). Nicholas Poppe (1965). Turkic–Mongolic–Tungusic and perhaps Korean. Martine Robbeets (2004, 2005, 2007, 2008) (in the form of "Transeurasian"). G. J. Ramstedt (1952–1957). Turkic–Mongolic–Tungusic–Korean. George Starostin (A. Dybo and G. Starostin 2008). Sergei Starostin (1991, S. Starostin et al. 2003). John C. Street (1962). Turkic–Mongolic–Tungusic and Korean–Japanese–Ainu, grouped as "North Asiatic". Gerard Clauson (1956, 1959, 1962). Gerhard Doerfer (1963, 1966, 1967, 1968, 1972, 1973, 1974, 1975, 1981, 1985, 1988, 1993). Juha Janhunen (1992, 1995) (tentative support of Mongolic-Tungusic). Alexander Vovin (2005, 2010). Formerly an advocate of Altaic (1994, 1995, 1997, 1999, 2000, 2001), now a critic. Alexander B. M. Stiven (2008, 2010). James Patrie (1982). Turkic–Mongolic–Tungusic and Korean–Japanese–Ainu, grouped in a common taxon (cf. John C. Street 1962). J. Marshall Unger (1990). Tungusic–Korean–Japanese ("Macro-Tungusic"), with Turkic and Mongolic as separate language families. Joseph Greenberg (2000–2002). Turkic–Mongolic–Tungusic and Korean–Japanese–Ainu, grouped in Eurasiatic. Lars Johanson (2010). Agnostic, proponent of a "Transeurasian" verbal morphology not necessarily genealogically linked. For much of the 19th and the early 20th centuries, the theory of a common Ural–Altaic family was widespread, based on such shared features as vowel harmony and agglutination. Starostin's (1991) lexicostatistical research claimed that the proposed Altaic groups shared about 15–20% of potential cognates within a 110-word Swadesh-Yakhontov list (e.g. Turkic–Mongolic 20%, Turkic–Tungusic 18%, Turkic–Korean 17%, Mongolic–Tungusic 22%, Mongolic–Korean 16%, Tungusic–Korean 21%). Altogether, Starostin concluded that the Altaic grouping was substantiated, though "older than most other language families in Eurasia, such as Indo-European or Finno-Ugric, and this is the reason why the modern Altaic languages preserve few common elements". In 2003 Starostin and others published an expanded list of 2,800 proposed cognate sets, a set of sound laws based on those proposed sets, and a number of grammatical correspondences, as well as a few important changes to the reconstruction of Proto-Altaic. For example, although most of today's Altaic languages have vowel harmony, Proto-Altaic as reconstructed by them lacked it; instead, various vowel assimilations between the first and second syllables of words occurred in Turkic, Mongolic, Tungusic, Korean, and Japonic. The authors tried hard to distinguish loans between Turkic and Mongolic and between Mongolic and Tungusic from cognates; and it suggests words that occur in Turkic and Tungusic but not in Mongolic. All other combinations between the five branches also occur in the book. It lists 144 items of shared basic vocabulary, including words for such items as 'eye', 'ear', 'neck', 'bone', 'blood', 'water', 'stone', 'sun', and 'two'. The earliest known texts in a Turkic language are the Orkhon inscriptions, 720–735 AD. :3 They were deciphered in 1893 by the Danish linguist Vilhelm Thomsen in a scholarly race with his rival, the German–Russian linguist Wilhelm Radloff. However, Radloff was the first to publish the inscriptions. The first Tungusic language to be attested is Jurchen, the language of the ancestors of the Manchus. A writing system for it was devised in 1119 AD and an inscription using this system is known from 1185 (see List of Jurchen inscriptions). The earliest Mongolic language of which we have written evidence is known as Middle Mongol. It is first attested by an inscription dated to 1224 or 1225 AD, the Stele of Yisüngge, and by the Secret History of the Mongols, written in 1228 (see Mongolic languages). The earliest Para-Mongolic text is the Memorial for Yelü Yanning, written in the Khitan large script and dated to 986 AD. However, the Inscription of Hüis Tolgoi, discovered in 1975 and analysed as being in an early form of Mongolic, has been dated to the 7th century. The prehistory of the peoples speaking the "Altaic" languages is largely unknown. Whereas for certain other language families, such as the speakers of Indo-European, Uralic, and Austronesian, it is possible to frame substantial hypotheses, in the case of the proposed Altaic family much remains to be done. Some scholars have conjectured a possible Uralic and Altaic homeland in the Central Asian steppes. According to Juha Janhunen, the ancestral languages of Turkic, Mongolic, Tungusic, Korean, and Japanese were spoken in a relatively small area comprising present-day North Korea, Southern Manchuria, and Southeastern Mongolia. However Janhunen is sceptical about an affiliation of Japanese to Altaic, while András Róna-Tas remarked that a relationship between Altaic and Japanese, if it ever existed, must be more remote than the relationship of any two of the Indo-European languages. :77 Ramsey stated that "the genetic relationship between Korean and Japanese, if it in fact exists, is probably more complex and distant than we can imagine on the basis of our present state of knowledge". Supporters of the Altaic hypothesis formerly set the date of the Proto-Altaic language at around 4000 BC, but today at around 5000 BC or 6000 BC. This would make Altaic a language family about as old as Indo-European (4000 to 7,000 BC according to several hypotheses) but considerably younger than Afroasiatic (c. 10,000 BC:33 or 11,000 to 16,000 BC:35–36 according to different sources). ^ a b Stefan Georg, Peter A. Michalove, Alexis Manaster Ramer, and Paul J. Sidwell (1999): "Telling general linguists about Altaic". Journal of Linguistics, volume 35, issue 1, pages 65–98. ^ "Interactive Maps The Altaic Family from The Tower of Babel". Starling.rinet.ru. Retrieved 18 June 2013. ^ Lyle Campbell and Mauricio J. Mixco (2007): A Glossary of Historical Linguistics; University of Utah Press. Page 7: "While 'Altaic' is repeated in encyclopedias and handbooks most specialists in these languages no longer believe that the three traditional supposed Altaic groups, Turkic, Mongolian and Tungusic, are related." ^ Johanna Nichols (1992) Linguistic Diversity in Space and Time. Chicago University Press. Page 4: "When cognates proved not to be valid, Altaic was abandoned, and the received view now is that Turkic, Mongolian, and Tungusic are unrelated." ^ R. M. W. Dixon (1997): The Rise and Fall of Languages. Cambridge University Press. Page 32: "Careful examination indicates that the established families, Turkic, Mongolian, and Tungusic, form a linguistic area (called Altaic)...Sufficient criteria have not been given that would justify talking of a genetic relationship here." ^ a b Asya Pereltsvaig (2012) Languages of the World, An Introduction. Cambridge University Press. Pages 211-216: "[...T]his selection of features does not provide good evidence for common descent" [...] "we can observe convergence rather than divergence between Turkic and Mongolic languages--a pattern than is easily explainable by borrowing and diffusion rather than common descent"
^ Roger Blench and Mallam Dendo (2008): "Stratification in the peopling of China: how far does the linguistic evidence match genetics and archaeology?" In Alicia Sanchez-Mazas et al., eds. Human migrations in continental East Asia and Taiwan: genetic, linguistic and archaeological evidence, chapter 4. Taylor & Francis. ^ a b c d e f Sergei Starostin, Anna V. Dybo, and Oleg A. Mudrak (2003): Etymological Dictionary of the Altaic Languages, 3 volumes. ISBN 90-04-13153-1. ^ "Browse by Language Family". Ethnologue. Retrieved 18 June 2013. ^ a b c Nicholas Poppe (1965): Introduction to Altaic Linguistics. Volume 14 of Ural-altaische Bibliothek. Otto Harrassowitz, Wiesbaden. ^ Alexis Manaster Ramer and Paul Sidwell (1997): "The truth about Strahlenberg's classification of the languages of Northeastern Eurasia." Journal de la Société finno-ougrienne, volume 87, pages 139–160. ^ Roy Andrew Miller (1986): Nihongo: In Defence of Japanese. ISBN 0-485-11251-5. ^ Gustaf John Ramstedt (1952): Einführung in die altaische Sprachwissenschaft ("Introduction to Altaic Linguistics"). Volume I, Lautlehre ("Phonology"). ^ Roy Andrew Miller (1991): "Genetic connections among the Altaic languages." In Sydney M. Lamb and E. Douglas Mitchell (editors), Sprung from Some Common Source: Investigations into the Prehistory of Languages, 1991, 293–327. ISBN 0-8047-1897-0. ^ Nicholas Poppe (1976): "Review of Karl H. Menges, Altajische Studien II. Japanisch und Altajisch (1975)". In The Journal of Japanese Studies, volume 2, issue 2, pages 470–474. ^ a b c Roy Andrew Miller (1971): Japanese and the Other Altaic Languages. University of Chicago Press. ISBN 0-226-52719-0. ^ Unger (1990)J. Marshall Unger (1990) "Summary report of the Altaic panel." In Philip Baldi, ed., Linguistic Change and Reconstruction Methodology, pages 479–482. Mouton de Gruyter, Berlin. ^ Martine Irma Robbeets (2015): Diachrony of verb morphology - Japanese and the Transeurasian languages. Mouton de Gruyter. ^ John C. Street (1962): "Review of N. Poppe, Vergleichende Grammatik der altaischen Sprachen, Teil I (1960)". Language, volume 38, pages 92–98. ^ James Tyrone Patrie (1978): The genetic relationship of the Ainu language. Ph. D. thesis, University of Hawaii. ^ Joseph Greenberg (2000-2002): Indo-European and Its Closest Relatives: The Eurasiatic Language Family, 2 volumes. Stanford University Press. ^ Schönig (2003): "Turko-Mongolic Relations." In The Mongolic Languages, edited by Juha Janhunen, pages 403–419. Routledge. ^ Stefan Georg (2005): "Reply (to Starostin response, 2005)". Diachronica volume 22, issue 2, pages 455–457. ^ Alexander Vovin (2005): "The end of the Altaic controversy" [review of Starostin et al. (2003)]. Central Asiatic Journal volume 49, issue 1, pages 71–132. ^ Asya Pereltsvaig (2011): "The Altaic family controversy". Languages Of The World website, published on 2011-02-16. Accessed on 2017-02-14. ^ Václav Blažek (2006): "Current progress in Altaic etymology." Linguistica Online, 30 January 2006. Accessed on 2019-03-22. ^ Martine Robbeets (2007): "How the actional suffix chain connects Japanese to Altaic." In Turkic Languages, volume 11, issue 1, pages 3–58. ^ Lars Johanson (2010): "The high and low spirits of Transeurasian language studies" in Johanson and Robbeets, eds. Transeurasian Verbal Morphology in a Comparative Perspective: Genealogy, Contact, Chance., pages 7–20. Harrassowitz, Wiesbaden. Quote: "The dark age of pro and contra slogans, unfair polemics, and humiliations is not yet completely over and done with, but there seems to be some hope for a more constructive discussion." ^ Sergei A. Starostin (1991): Altajskaja problema i proisxoždenie japonskogo jazyka ('The Altaic Problem and the Origin of the Japanese Language'). Nauka, Moscow. ^ Nikoloz Silagadze, "The Homeland Problem of Indo-European Language-Speaking Peoples", 2010. Faculty of Humanities at Ivane Javakhishvili Tbilisi State University. ISSN 1987-8583. ^ Y.N. Matyuishin (2003), pages 368-372. ^ Lars Johanson and Martine Irma Robbeets (2010): Transeurasian Verbal Morphology in a Comparative Perspective: Genealogy, Contact, Chance.. Introduction to the book, pages 1-5. ^ Juha Janhunen (1992): "Das Japanische in vergleichender Sicht". Journal de la Société finno-ougrienne, volume 84, pages 145–161. ^ S. Robert Ramsey (2004): "Accent, Liquids, and the Search for a Common Origin for Korean and Japanese". Japanese Language and Literature, volume 38, issue 2, page 340. American Association of Teachers of Japanese. 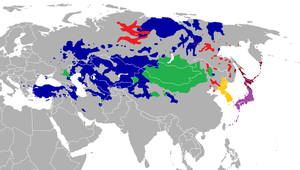 ^ Igor M. Diakonoff (1988): Afrasian Languages. Nauka, Moscow. Aalto, Pentti. 1955. "On the Altaic initial *p-." Central Asiatic Journal 1, 9–16. Anonymous. 2008. [title missing]. Bulletin of the Society for the Study of the Indigenous Languages of the Americas, 31 March 2008, 264: ____. Antonov, Anton; Jacques, Guillaume (2012). "Turkic kümüš 'silver' and the lambdaism vs sigmatism debate". Turkic Languages. 15.2: 151–170. Anthony, David W. 2007. The Horse, the Wheel, and Language. Princeton: Princeton University Press. Boller, Anton. 1857. Nachweis, daß das Japanische zum ural-altaischen Stamme gehört. Wien. Clauson, Gerard. 1959. "The case for the Altaic theory examined." Akten des vierundzwanzigsten internationalen Orientalisten-Kongresses, edited by H. Franke. Wiesbaden: Deutsche Morgenländische Gesellschaft, in Komission bei Franz Steiner Verlag. Clauson, Gerard. 1968. "A lexicostatistical appraisal of the Altaic theory." Central Asiatic Journal 13: 1–23. Doerfer, Gerhard. 1973. "Lautgesetze und Zufall: Betrachtungen zum Omnicomparativismus." Innsbrucker Beiträge zur Sprachwissenschaft 10. Doerfer, Gerhard. 1974. "Ist das Japanische mit den altaischen Sprachen verwandt?" Zeitschrift der Deutschen Morgenländischen Gesellschaft 114.1. Doerfer, Gerhard. 1985. Mongolica-Tungusica. Wiesbaden: Otto Harrassowitz. Georg, Stefan. 1999 / 2000. "Haupt und Glieder der altaischen Hypothese: die Körperteilbezeichnungen im Türkischen, Mongolischen und Tungusischen" ('Head and members of the Altaic hypothesis: The body-part designations in Turkic, Mongolic, and Tungusic'). Ural-altaische Jahrbücher, neue Folge B 16, 143–182. Lee, Ki-Moon and S. Robert Ramsey. 2011. A History of the Korean Language. Cambridge: Cambridge University Press. Menges, Karl. H. 1975. Altajische Studien II. Japanisch und Altajisch. Wiesbaden: Franz Steiner Verlag. Miller, Roy Andrew. 1980. Origins of the Japanese Language: Lectures in Japan during the Academic Year 1977–1978. Seattle: University of Washington Press. ISBN 0-295-95766-2. Ramstedt, G.J. 1952. Einführung in die altaische Sprachwissenschaft I. Lautlehre, 'Introduction to Altaic Linguistics, Volume 1: Phonology', edited and published by Pentti Aalto. Helsinki: Suomalais-Ugrilainen Seura. Ramstedt, G.J. 1957. Einführung in die altaische Sprachwissenschaft II. Formenlehre, 'Introduction to Altaic Linguistics, Volume 2: Morphology', edited and published by Pentti Aalto. Helsinki: Suomalais-Ugrilainen Seura. Ramstedt, G.J. 1966. Einführung in die altaische Sprachwissenschaft III. Register, 'Introduction to Altaic Linguistics, Volume 3: Index', edited and published by Pentti Aalto. Helsinki: Suomalais-Ugrilainen Seura. Robbeets, Martine. 2004. "Swadesh 100 on Japanese, Korean and Altaic." Tokyo University Linguistic Papers, TULIP 23, 99–118. Robbeets, Martine. 2005. Is Japanese related to Korean, Tungusic, Mongolic and Turkic? Wiesbaden: Otto Harrassowitz. Strahlenberg, P.J.T. von. 1738. Russia, Siberia and Great Tartary, an Historico-geographical Description of the North and Eastern Parts of Europe and Asia.... (Reprint: 1970. New York: Arno Press.) English translation of the previous. Tekin, Talat. 1994. "Altaic languages." In The Encyclopedia of Language and Linguistics, Vol. 1, edited by R.E. Asher. Oxford and New York: Pergamon Press. Vovin, Alexander. 1993. "About the phonetic value of the Middle Korean grapheme ᅀ." Bulletin of the School of Oriental and African Studies 56(2), 247–259. Vovin, Alexander. 1994. "Genetic affiliation of Japanese and methodology of linguistic comparison." Journal de la Société finno-ougrienne 85, 241–256. Vovin, Alexander. 2001. "Japanese, Korean, and Tungusic: evidence for genetic relationship from verbal morphology." Altaic Affinities (Proceedings of the 40th Meeting of PIAC, Provo, Utah, 1997), edited by David B. Honey and David C. Wright, 83–202. Indiana University, Research Institute for Inner Asian Studies. Vovin, Alexander. 2010. Koreo-Japonica: A Re-Evaluation of a Common Genetic Origin. University of Hawaii Press. Whitney Coolidge, Jennifer. 2005. Southern Turkmenistan in the Neolithic: A Petrographic Case Study. Oxbow Books. Hahn, Reinhard F. 1994. LINGUIST List 5.908, 18 August 1994. Janhune, Juha. 1995. "Prolegomena to a Comparative Analysis of Mongolic and Tungusic". Proceedings of the 38th Permanent International Altaistic Conference (PIAC), 209–218. Wiesbaden: Harrassowitz. Johanson, Lars. 1999. "Attractiveness and relatedness: Notes on Turkic language contacts." Proceedings of the Twenty-fifth Annual Meeting of the Berkeley Linguistics Society: Special Session on Caucasian, Dravidian, and Turkic Linguistics, edited by Jeff Good and Alan C.L. Yu, 87–94. Berkeley: Berkeley Linguistics Society. Johanson, Lars. 2002. Structural Factors in Turkic Language Contacts, translated by Vanessa Karam. Richmond, Surrey: Curzon Press. Kortlandt, Frederik. 1993. "The origin of the Japanese and Korean accent systems." Acta Linguistica Hafniensia 26, 57–65. Martin, Samuel E. 1966. "Lexical evidence relating Korean to Japanese." Language 12.2, 185–251. Nichols, Johanna. 1992. Linguistic Diversity in Space and Time. Chicago: University of Chicago Press. Robbeets, Martine. 2004. "Belief or argument? The classification of the Japanese language." Eurasia Newsletter 8. Graduate School of Letters, Kyoto University. Ruhlen, Merritt. 1987. A Guide to the World's Languages. Stanford University Press. Sinor, Denis. 1990. Essays in Comparative Altaic Linguistics. Bloomington: Indiana University, Research Institute for Inner Asian Studies. ISBN 0-933070-26-8. Vovin, Alexander. 2009. Japanese, Korean, and other ‘non-Altaic’ languages. Central Asiatic Journal 53 (1): 105-147. Wikimedia Commons has media related to Altaic languages.